Centerless brushes are large radial brushes for use on Cincinnati No. 2 and 3, Landis No. 5, and Hammond thru-feed centerless grinders. The development of centerless brushes for use on conventional centerless grinders has expanded the range of applications for centerless grinders, to include edge blending, removing sharp edges, tool and grinding marks, feather grinding burrs, improving surface finish, eliminating areas of stress concentration, and increasing production finishing rates. Centerless brushes can be densely filled with a choice of metal wire types and gauges made from a variety of metallic materials. In addition to the metal wire fill options offered, centerless grinding brushes can be filled using natural materials such as Tampico Fiber, or synthetic materials such as Abrasive Nylon filaments which are available in a variety of grit sizes. The wire selection includes high carbon steel, 304 stainless steel wire, brass wire, bronze wire. Spiral Brushes’ standard centerless brush has a 20” outer diameter, a 12” i.d. 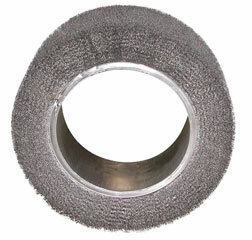 arbor hole, and a 6” wide brush face, although wider (up to 10”) and narrower (down to 3 ½”) brush faces are available. Standard is Rolled & Welded Core, but a Machined Core is available as a smoother running upcharge.